Providing a knowledge base is great way to help customers find solutions to problems on their own. This is referred to as ticket deflection and it's essential for scaling the support you provide to your customers. Your Support plan includes Guide Lite, which gives you a branded customer-facing support site, called Help Center. Help Center is where you can publish knowledge base content, and it's also a place your customers can make support requests. If you upgrade to Guide Professional, you'll have access to more advanced features, including theme customization and a community. 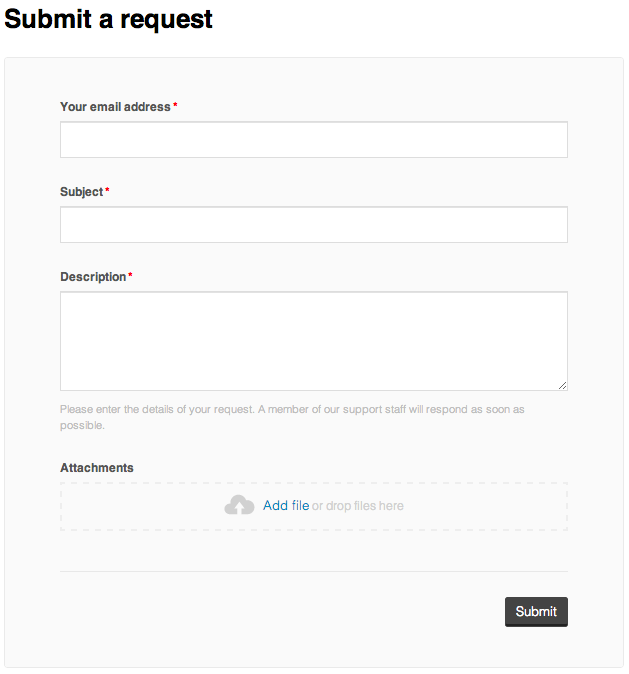 The Submit a Request form is automatically added to your Help Center. No set up required. Themes let you change the look and feel of your Help Center. You can apply different pre-made themes or with some versions of Guide, you can create your own themes. 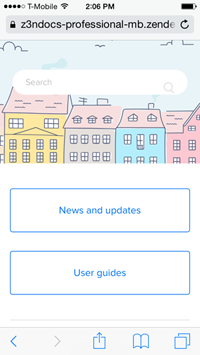 Guide comes with The Copenhagen theme which is a responsive theme, designed for mobile devices. 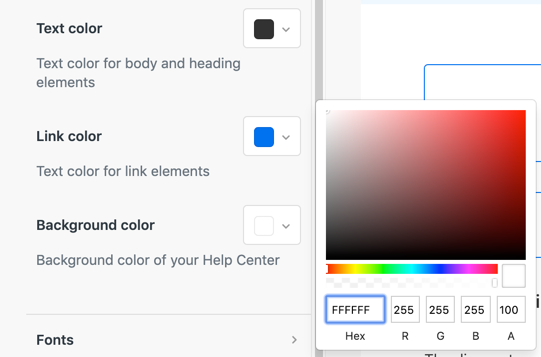 This theme is enabled by default when you set up your Help Center, or you can switch to it if you are currently using a different theme (see Changing the theme of your Help Center). Before we continue with this lesson, take a minute to check out our Getting Started with Guide. To get started with your Help Center, you first need to create it. After you create it, the Help Center will be in setup mode and only you and your agents will be able view it. Your end-users won't have access to it until you decide that it's ready to go live and you activate it. In Zendesk Support, click the Zendesk products icon ( ), then select Guide. In the page that appears, accept the terms and conditions, then click Enable Guide. Your Help Center is created using the default theme. You have many options for customizing the look of your Help Center. We'll talk more about customization shortly. In an earlier lesson, we mentioned Zendesk Support user roles (end-user, agent, administrator, and account owner). Guide adds a user role called Guide Manager. Guide managers have full access to the Help Center. By default, all administrators are Guide Managers. All agents are Guide Viewers. You can extend the Guide Manager role to select agents as well. For example, you may need web designers, writers, editors, community moderators, and production specialists to work on your Help Center. To give them access, add them as Zendesk Support agents and then assign the Guide Manager role to them. If you don't want to give agents full access to the Help Center, you can grant editing access for agents at the section level as needed. This give agents the ability to add, edit, and delete content in designated sections. End-users can't contribute to the knowledge base; the community (if available) is where they can post questions and help other customers by providing answers. You can control who can access your Help Center. Why would you ever restrict access to your Help Center? It depends on who your customers are: a select group or groups of people or everyone. In addition, you can set access restrictions on specific areas of content in your Help Center. For example, restricting part of your knowledge base or community to just VIP customers. Extending your brand to your Help Center is an important part of creating a seamless user experience. You have a lot of flexibility to change the look and feel of your Help Center. To keep it simple, you can quickly add your product logo and your brand's colors and web fonts using simple WYSIWYG tools such as color pickers and font choosers. Underlying the design of the Help Center is your theme. Copenhagen theme is enabled by default when you set up your Help Center. This is a best practices, responsive theme. If you've enabled Zendesk Chat, your customers can initiate a chat session with one of your agents by simply clicking the Chat button. The conversation between your agent and customer is captured in a ticket. You can easily apply your brand to your Help Center. In Guide Admin, click the Settings icon ( ) in the sidebar, then click Customize design. Choose the theme you want to edit, and click View Theme. 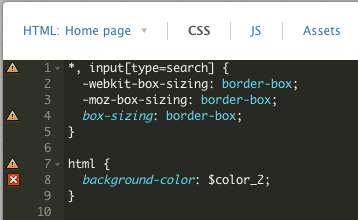 In the Colors section, change the background color of the page by clicking the color picker. If you know the hexadecimal value of your company's brand color, you can enter it manually in the text box. Example: FFDB9C. When you make a change, the page refreshes to let you preview it on the page. Changes don't take effect until you click Publish. To add a logo, in the Brand section, click Replace and upload an image. If you're satisfied with your changes, click Publishat the top. If you want to cancel your changes instead, click the Discard Changes link in the sidebar. The knowledge base is where users look for the official content from your organization. Use it to provide FAQs, tutorials, how-to articles, processes and procedures, and reference documentation. Starting a knowledge base from scratch can be a daunting task. You can start small with a few articles and build from there. A best practice is to focus on creating content to answer your customers most common questions, issues, and pain points. 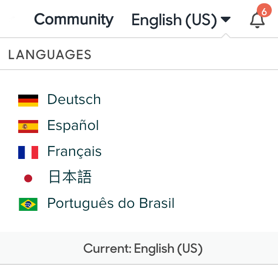 If you support multiple languages and have knowledge base content in all those languages, you add it all into your Help Center. No need to create separate Help Centers for each language. You must be on Guide Professional with Support Professional or Enterprise to add localized content. When customers visit your Help Center, their web browser language preference is detected and the appropriate language content is displayed. Each customer can also choose their Help Center language preference using the language selector. If a customer's language isn't supported in your Help Center, they'll see the default language content. For example, if your default language is English they'll see English content. All new articles in the Help Center are created as drafts. The drafts are saved but not published. You can work on them until you're ready to publish them. To view all the draft articles in progress, in Guide, click the Manage articles ( ) icon in the sidebar, then click Draft. On Guide Professional, the Help Center includes a community platform that lets end-users help other end-users and share ideas and tips. The community consists of posts associated with different discussion topics. A post might be anything, including questions, tips, or feature requests. End-users can vote on other end-users' contributions and track issues by following discussion topics or specific questions. They'll be notified when somebody creates or updates a post or adds a response. Guide Managers can edit posts, add them to other topics, or delete them. Agents don't have the permissions to make these changes. Community posts are associated with discussion topics. Guide managers can add, edit, or delete topics. Agents don't have the permissions to make these changes. Topics can be anything you want. If you support multiple products, you might add a topic for each product. If you have one product with a lot of functionality, you might add a topic for each major feature area or task. You can also add a General Discussion topic where users can gather to discuss issues that don't quite fit in the other topics. You can monitor this topic for emerging issues that might deserve their own topics. Let's say you want to run an idea past your users. You can post your idea in the community and get feedback from your customers. In the Community page, click New post in the top-right side of any community page. Enter your idea and any details about it. Select a community topic for the idea from the drop-down menu. After you've set up your Help Center, added knowledge base content, and established your community topics, you will need to activate it to make it live for all your customers. That's when phase two starts: managing your Help Center. It's important that your Help Center is a hub of activity and this means that when a customer asks a question that they get a timely response. If customers don't feel like their comments are being answered, they will either not come back to your Help Center or they'll file a ticket, which defeats the purpose of providing a Help Center to deflect tickets. It's best to assign one or more agents to monitor your Help Center and provide answers to your customers questions. This keeps your Help Center active and encourages customers to participate and return. As you build up a community of users you'll find that they'll begin to help each other and that your agents won't have to answer every question. Keep in mind that every question asked and answered is enriching your knowledge base and subsequent visitors to your Help Center may not need to ask any questions at all. It's also good to draw some attention to your Help Center so that your customers know that's a resource available to them. To promote your Help Center you can send out an email and announce it on your website or on social media networks. Also, be sure to add the link prominently on pages on your website, in emails, and in the product user interface if applicable. Tip: One of the most effective ways to leverage your Help Center is to include links to it in your replies to customer requests. For example, a request about resetting a password is best handled by a macro that includes a link to the Help Center article that explains how to do that.